ENG) I sketched these two in reply to Garnet John's and Adam Temple's proposals. I made them a little more story heavy than the old ones, by introducing an extra character. I hope you guys like them. Thanks for playing! ESP) He dibujado estos dos en respuesta a los retos propuestos por Garnet John y Adam Temple. Les he metido algo mas de historia añadiendo un personaje extra a cada uno. Espero que os gusten. Gracias por jugar! EUS) Honako hauek Garnet John eta Adam Temple-k ezarritako lehiei erantzun bezala marraztu ditut. Haurrekoei baino istoria geixeago sartu diet, beste pertsonai bat geituz bakoitzean. Gustoko izango dituzuela espero dut. Eskerrik asko jolasteagatik! I owe this one to you Sir. Hey Dei, so awesome man, I love the other designs too. 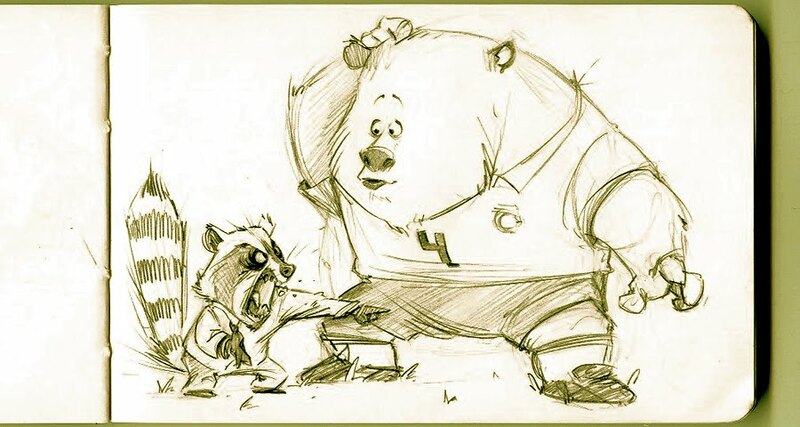 Only hing is Garnet said "I want a racoon that is the coach of a top football team." And when I look at the player he doesnt seem like hes wearing a Tottenham jersey. Whats with this?